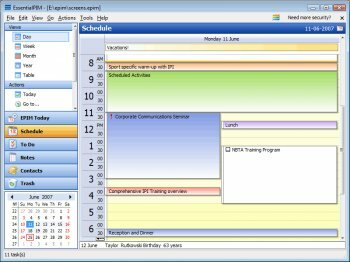 This absolutely free personal information manager can store, manage and encrypt data: day/week/month/year schedules, to do lists for keeping all your tasks up-to-date, notes (pictures, tables, any formatted text), and contacts. Offers Rijndael 128-bit encryption, MS Outlook import/export, Windows Address Book import/export, search capabilities, versatile print features, and adjustable contacts storage with unlimited fields. EPIM is an Outlook like application but... it is more powerful ! * it's possible to search in any modules (todo, appointment, contact, password manager, notes, emails) in real time (match elements are showed while writing the word). * it's possible to synchronize with a lot of products : Outlook, PocketPC, Palm, online web (Google, CalDav, Yahoo...) and EPIM team will works on Android and iPhone sync. There forum lets write suggestions and support questions. Got an error message too! Tried the pro version as well, even worse. "Violation of primary unique key on contact table ..."
For whatever reason I could not find a standard calendar view (month...?). Uk'sKalendar solved that and Kurlo took care of contacts beautifully (just remember to use a fairly simple password!). Finally decided to dedicate software for my contacts and other than using tbird with lightning (never again) there was simply nothing else for free. That was 4 releases ago!! to which they quickly released another version 3 days later (which surprise surprise NOD had nothing to say about). NOD32 is wrong, there is no any badware. You can check with any other reputable protection software. Threat was detected upon access to web by the application." The best PIM on the market, imho. Free version is good, but pro simply kicks as. I like that it's fast, lightweight and flexible. Also, you can sync it pretty much with everything starting from gCal to Outlook AND you can even sync over a network between epims! I prefer Open Source to Lite tools, but I have to admit, it works well for moving Outlook info to a different computer. It get a 4 for being Lite and not fully functional. Not a bad piece of software, would go well with Sylpheed. it doesnt need an open source alternative. This is great software. keep up the good work guys. And since its EssentialPIM 'Free', (which is not true freeware, but simply a promotional tool for their full featured version) it absolutely does need an open source alternative. AND since sunbird is standards compliant and has many more features, and with plugins its enterprise ready, I think you'll be far happier with it in the long run, and this one will go from 'free' to non-free when the company gets sick of making no money. I have seen 'free' products like this, even ones that say "we will always be free" go non-free in a real hurry. Its comanies like that which have destroyed 'freeware' for me, and many others. Dont quite understand the less than positive reviews, as this app seems more than fit for the purpose. The features are simple and work. Accessing older data via the import functions is straight forward, though it did re-sort some of the details (switching personal items into the business fields). The interface is neither elegant nor pretty, but nor is it brutal, and the items are easy to locate. It does what it says on the tin, quickly and efficiently without hogging resources, and its free. It would be churlish to ask for much else. I've used it for about six month now and still didn't like it. Can anyone suggest a replacement that is free?